“I am the king of this village! Every child belongs to me and I will spread my poison to a new person every day,” screams the snake, bursting onto the stage. In the audience, children gasp and jump backwards, their eyes wide. 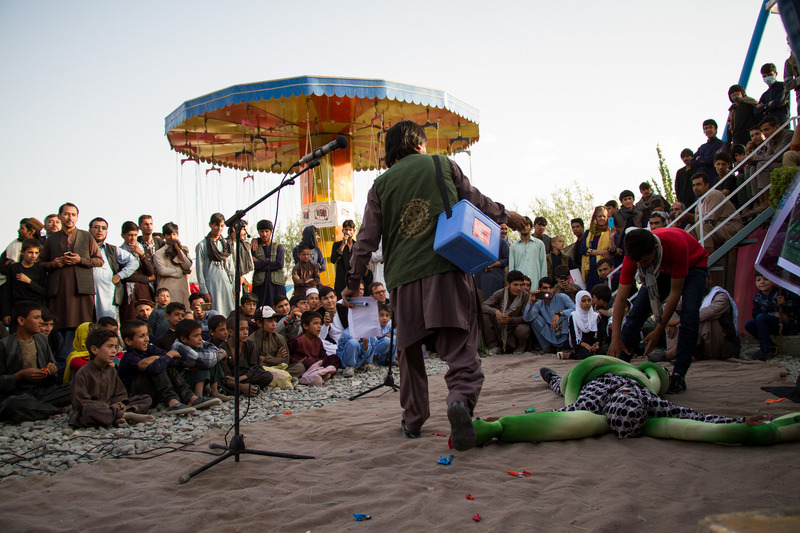 Hamid, clutching his precious box of vaccines, attacks the snake, managing to defeat him. The crowd cheers. 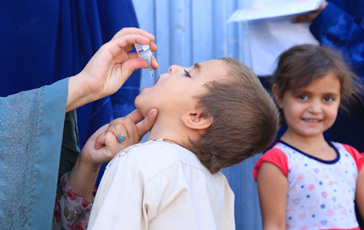 This poisonous snake – mor zaharia as it’s called in Dari – represents the dangerous threat of polio, a disease that Afghanistan is fighting hard to eradicate. 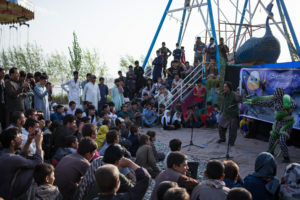 Hamid leads a touring youth circus group made up of children and teenagers from all across the capital, Kabul, who performs juggling, acrobatics and theatre routines for local audiences around the city and beyond. Today the circus is in Qargha, Kabul, Afghanistan. It was started 14 years ago by Mobile Mini Circus for Children and is supported by UNICEF. 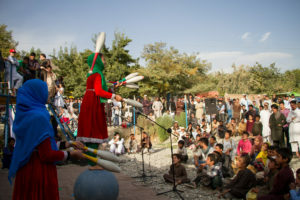 The circus enables the children who join – often from internally displaced communities around Kabul – to go to school every day and then practise circus skills at their centre after school and on weekends. 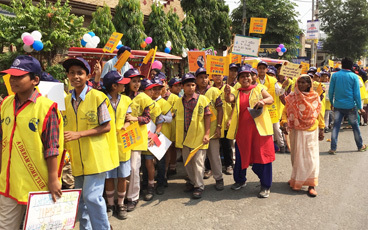 Part of their impressive performance includes passing on vital messages about healthcare and social issues to the audience, who may otherwise not have access to this information. “Our circus is entertainment and it is so much fun for the performers and for the audience,” says Hamid. This is especially true of the children, who flock to the circus the moment they see youngsters their own ages pull out their juggling sticks and begin clowning around on the makeshift stage. 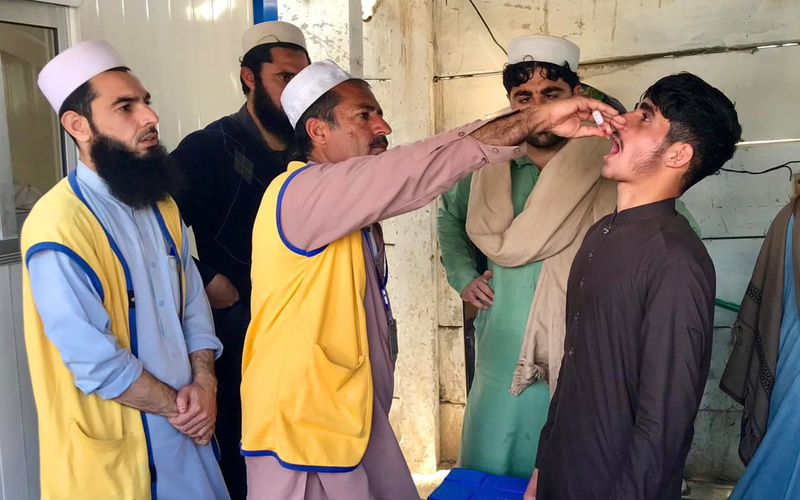 These conditions provide the perfect environment for communicable diseases like polio to spread; yet a simple oral vaccination, just two drops in the mouth, can bring a child closer to a life without polio. 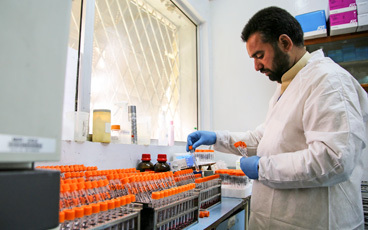 Children in Afghanistan will be vaccinated against polio multiple times, until the disease is stopped for good. 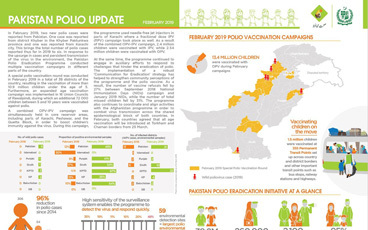 During the August and September 2017 National Immunization Days 9.9 million children under five across Afghanistan were targeted with repeat doses of the oral polio vaccine.